The “blocking bet” (or blocker bet) is made when you are out of position and wish to see either a showdown or a river card cheaply. If used effectively it can prevent your opponent from making a big bet that you can not profitably call. If used incorrectly, or in the wrong circumstances, this blocking bet is simply a waste of chips. The What: A blocker bet refers to betting from out-of-position in order to control how much money goes into the pot on a given betting round. Use blocking bets like a shield to protect the rest of your stack. The Why: When you’re holding a marginal hand that can’t stand up to a big bet, you can make a small bet that is likely to get called, but not raised, in order to see another card or get to showdown for a cheaper price. The When: Blocking bets are always made from out of position since you must be able to act before your opponent. The Who: Because making a small bet leaves you open to getting bluffed with a re-raise this move is best suited to use against tight, inexperienced opponents. The Where: Blocking bets can be used effectively in both cash games and tournaments. Not everyone agrees on whether blocking bets are truly effective, but they’ll all tell you that if you’re doing it wrong, you’re burning money. We’re here to tell you that at the right time, against the right opponent, a blocking bet can absolutely increase your winnings. The important part of using blocking bets is understanding the line you’re taking in the hand, and the kind of opponent you’re up against. Weaker, tighter players are your targets when you’re thinking about using a blocking bet, because an experienced, tough player will be able to exploit you by bluff-raising. There are two main situations where you should consider a blocking bet. An example of a blocking bet. Action is folded around to you pre-flop. You limp in from the small blind with JTo, your opponent raises from the big blind pre-flop, and you call. The flop comes down A–J–2. You check, and he makes a continuation bet, which you call. The turn brings a 5, you check, and your opponent checks. Now the river brings a 8, and you are not sure if you have the best hand. If you do, you know your opponent wont call a large bet, so you decide to make a smallish blocking bet on the river to try and get some thin value from weaker pairs and get to showdown cheaply. The blocking bet is simply where you make a smaller than average sized bet when first to act in order to reduce the amount of money that you pay to see the next card. By making a small bet, you anticipate that your opponent will just call and not raise. As a result, you will not have to call what would have been a larger bet from them (in comparison to your “blocker bet”) if you had checked. The advantages of the blocking bet. There are two advantages to the blocking bet play. If you complete your draw, you expect to get paid off well. It is only necessary when you are out of position. If you make your flush on the river then you are very likely to be paid off by any player with a pair or better. 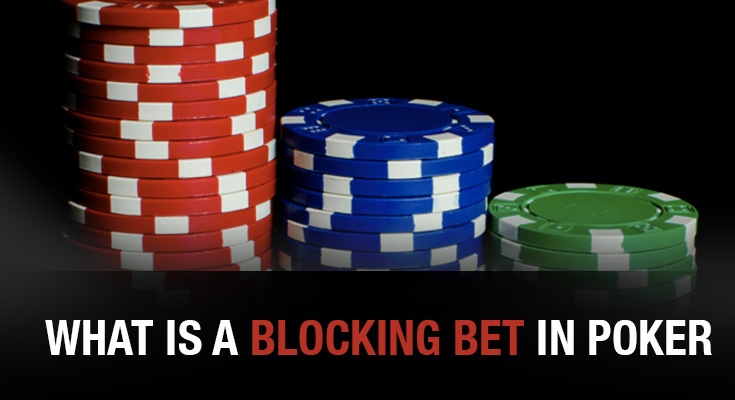 The blocking bet stopped your opponent from betting an amount that you would not have been able to call – and also disguised your holding at the same time. If you miss the river then a check and fold is probably optimal here against most opponents. If the positions had been reversed – you were on the button rather than the out of position player – then a blocking bet would not have been necessary here. Your opponent would have acted before you and could have bet enough that you were unable to call. If – after seeing his flop bet called – the player checked on the turn you would have been in a position to check behind to try and make your flush with a free card.